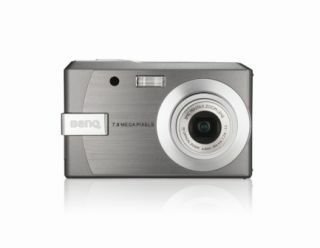 BenQ has unveiled its latest digital camera, the E720, which is a 7-megapixel camera in a brushed aluminium casing with a sub-£140 pricetag. Apart from the 7-megapixel sensor, the BenQ E720 also features 3x optical zoom, a Super Multi-Coating Pentax lens and a 2.5-inch LTPS display. As with most cameras these days, the E720 has a built-in anti-shake function to reduce blur, along with an ISO of 1200 to boost your shots in poor lighting conditions. The camera has 13 scene modes, movie recording with optical zoom and PictBridge.